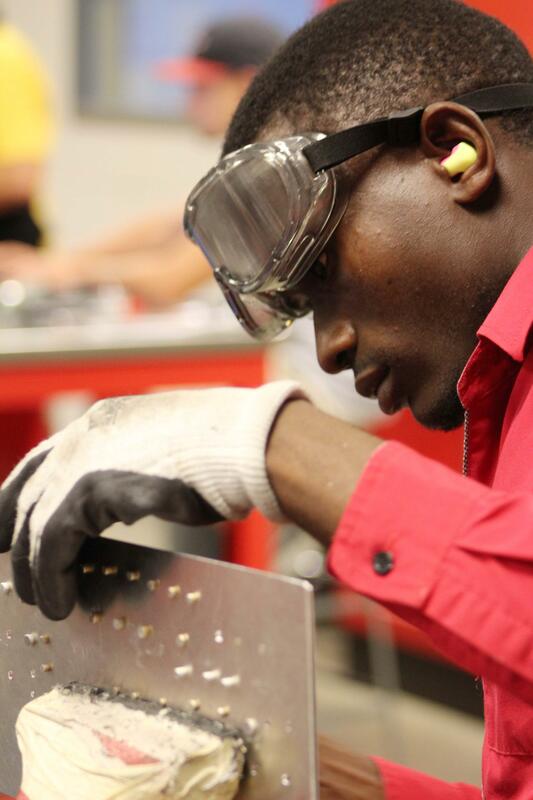 Julius Niyonzima during an aviation sheet metal composition class at WSU Tech. For refugees arriving in the U.S., getting a job is one of the most important – and pressing – steps toward self-sufficiency, and toward building a life in their new home. 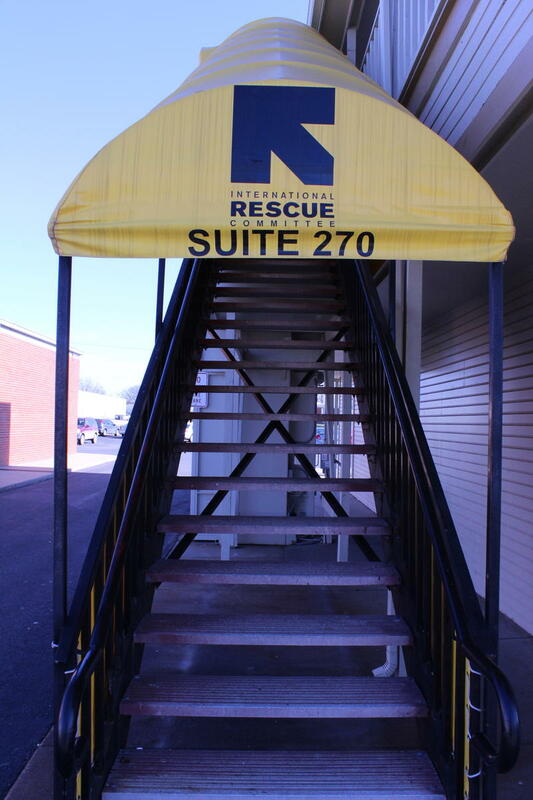 A new partnership between St. Francis Migration Ministries and WSU Tech is helping refugees in the area start new careers. Since May, the refugee resettlement agency has worked to get some of its clients enrolled in WSU Tech's Wichita Promise scholarship program, which offers fast-track certification courses and financial assistance to cover tuition and books. One of the first clients to go through the program is Julius Niyonzima. 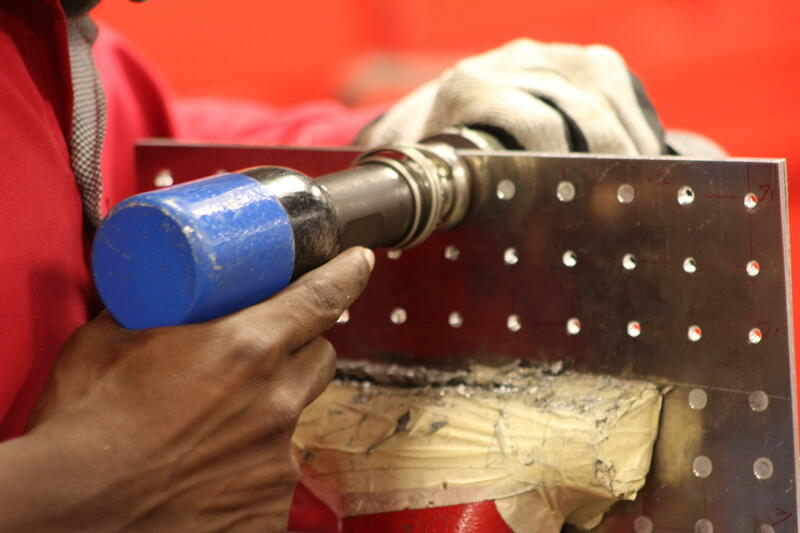 The 21-year-old is nearing the end of his eight-week course in aviation sheet metal composition. When he finishes, he'll have a technical certificate, and, he hopes, the start of a career in aviation. The class meets at the National Center for Aviation Training in north Wichita on a recent evening. Niyonzima has been in the U.S. for just about four months – he’s one of the nearly 400 refugees resettled in Kansas this year. He came to Wichita in June from a refugee camp in Uganda, where he spent the majority of his life. He and his grandparents settled at the camp after fleeing violence in the Democratic Republic of Congo when he was a toddler. Niyonzima didn’t even know he was a refugee until he was about 8 years old. When he was 12, his grandparents became ill and went back to Congo — but decided it was too dangerous to bring their grandson with them. He was left in Uganda to support himself, shearing sheep or doing subsistence farming, and at the same time, keep up with his studies in school, something he says many refugees struggled to do. “Life in the refugee camp was totally very hard, because for refugee kid to go to school, and because of being called a refugee you know you can’t access employment. ... you find that there is no value of education for some refugees," he said. 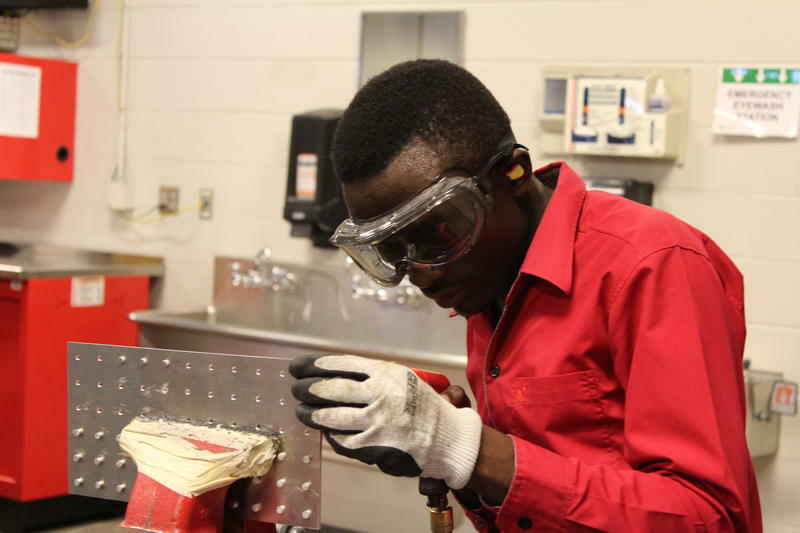 Niyonzima was studying business administration before he came to the U.S.; he earned his GED here to be eligible to enroll in the Wichita Promise program. By partnering with WSU Tech, "we were able to start working with some of our clients to put them into the positions where they would be able to better themselves through training first, instead of going into a basic job that may not turn into a career," said Gary Phelps, the employment program manager with St. Francis Migration Ministries. He works with about 40 employers around the city in a variety of industries to see what their needs are, and where the agency’s clients would be the best fit. “So what you would do is to try to figure out what the best options for our clients are based upon what they've already done," he said. "So if a person worked in landscaping or worked in gardening or farming or subsistence farming specifically, we could work in landscaping, we could work in gardening. When a refugee first arrives in the U.S., they receive modest benefits administered by the U.S. State Department to cover things like food, housing and clothing while they get acclimated to their new homes. Refugees also pay for their own flights to the U.S. – in most cases, they have to start making payments within six months of arriving. For many of Phelps’ clients, lower-level jobs – ones that don’t require strong English language skills or higher education — are a good fit, at least to begin with. St. Francis has close ties to some meat-packing companies and manufacturers in the state, where many refugees get their first jobs. But other clients, like Niyonzima, if they've completed secondary education in their home countries or received their GEDs here in the U.S., might be ready for jobs they can build into careers. 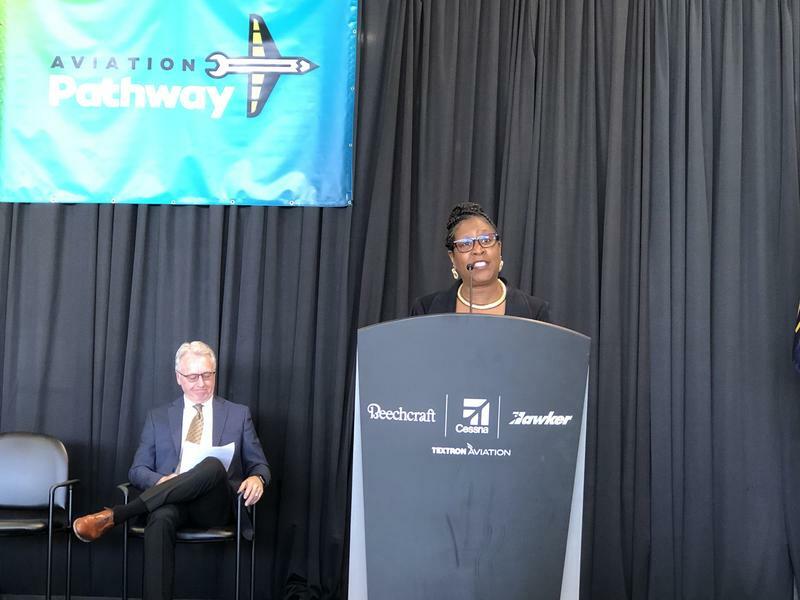 “After a certain amount of time, where a person is employed and want to better themselves and have upward mobility, and they may come back to us and say, ‘I need a different job, I need a career ladder, help me get to this point,' " Phelps said. For Niyonzima, that career ladder is in aviation. But Phelps says he hopes St. Francis Migration Ministries can eventually offer refugees access to training in other areas. Along with sheet metal composition, Niyonzima is also learning about the basics of job hunting: how to write a resume and a cover letter, how to do an interview. When he finishes his course with the Wichita Promise Program, he’ll have guaranteed interviews with some aviation companies in the area. 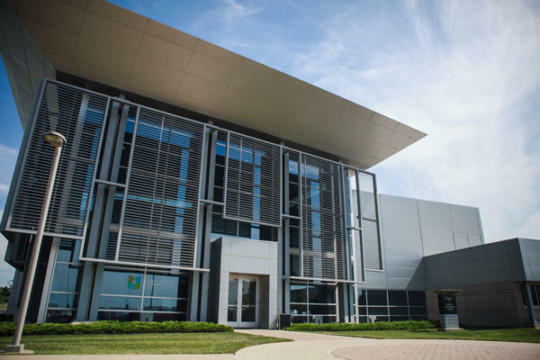 WSU Tech in Wichita is expanding an aviation training program in order to meet workforce demand from Spirit AeroSystems and other companies. 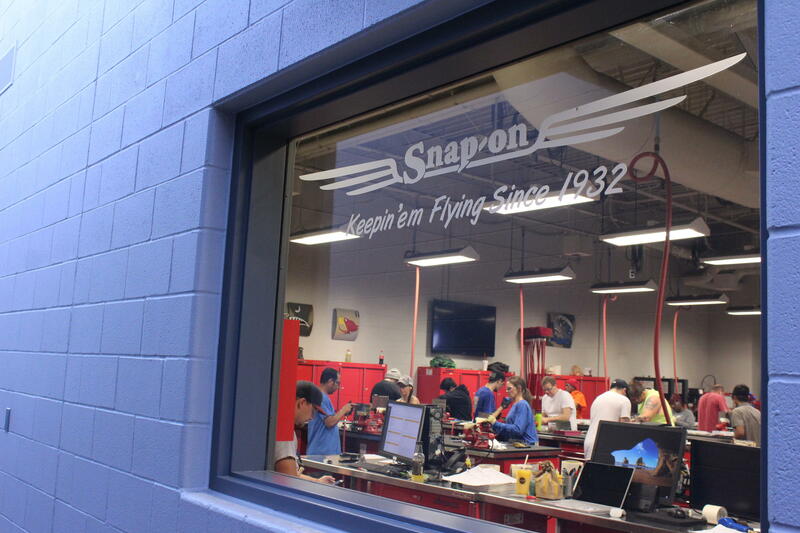 Wichita Public Schools on Monday proposed a new high school aviation curriculum, with the goal of getting students ready to work in the aviation industry immediately after graduation.